Nocturnes, préludes, waltzes - Frédéric Chopin was a Romantic composer responsible for some of the greatest piano music of the era. Learn more about him with our interesting facts. 1. When is Chopin's birthday? 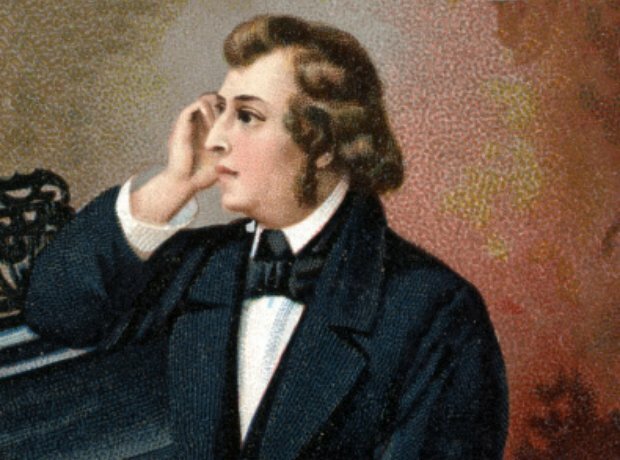 We know that Frederic Chopin was born in Poland, west of Warsaw, in 1810, but it's not 100% confirmed on what day. Local baptism records claim the composer came into the world on 22 February, but Chopin's parents said it was 1 March. 2. How do you pronounce Chopin's name? Chopin's name is pronounced 'Shoh-pan', with a nasal 'n'. Chopin was composing and writing poetry at six, and gave his first public concerto performance at the age of eight. It's not really surprising - his mother was a piano teacher, and his father played the flute and violin. Most of Chopin's music was written for piano. He wrote 59 mazurkas, 27 études, 27 preludes, 21 nocturnes and 20 waltzes for the instrument. Between 1827 and 1846, Chopin wrote 21 Nocturnes for solo piano. From his dreamlike Nocturne in E Flat Major Op. 9 No. 2 to his posthumous Nocturne in C-sharp minor, Chopin's Nocturnes have come to be considered among the finest short solo works for the piano. Chopin was very fond of Bach - who could blame him? He urged his piano pupils to practise Bach every day to strengthen their fingers and exercise their minds with the mathematical music. Despite only arriving in Paris in September 1831, Chopin never returned to his homeland of Poland. While he was in the city, he forged friendships with great composers including Mendelssohn, Berlioz and Liszt. As as way of making money while living in Paris, Chopin built up a book of rich contacts to whom he would give piano lessons. Unfortunately, he felt too embarrassed to ask his pupils for money, so he looked away while they left the fee on the mantelpiece! Chopin wrote around 23 polonaises throughout his life. His most famous examples are the Military' Polonaise in A, 'Heroic' or 'Drum' Polonaise in A flat. Like much of Chopin's music, most of the pieces are written for solo piano, but the Andante spianato et grande polonaise brillante is an orchestral piece. On the way back from Paris, Chopin met Maria Wodziński, daughter of his parents' friends. He fell in love with her and was engaged to marry her, but the wedding had to be postponed due to Chopin's bad health. He wrote 'The Farewell Waltz' on the morning of his departure from Dresden, and the relationship ended. Chopin's 'Minute' Waltz isn't minute, as in small, it's minute in that it lasts 60 seconds. Well, almost: the 138 bars of music take between a minute and a half and two minutes to play. Chopin's publishers decided on the nickname. Chopin was forced to postpone his engagement due to his health, but this was an ongoing problem. Word spread among people in Warsaw believed the composer had died because he was so ill in 1835. When Chopin visited Majorca, he had trouble bringing his precious piano along with him. The piano, made by the famous Pleyel et Cie company, was held up by customs from 20 December 1838 until 4 Jan 1839. Eventually George Sands agreed to pay 300 francs to have the instrument released. Chopin had an long and stormy affair with a novelist called George Sand after meeting her in 1836. At least, that's what she said her name was in order to get noticed in a society that didn't look favourably on female authors - her real name was Aurore Dudevant. 15. When did Chopin die? Chopin died in 1849, most probably from tuberculosis, at the age of 39. He is buried near his friend, composer Cerubini, at the Père Lachaise Cemetery in Paris. Mozart's Requiem was performed at his funeral.